Malala Yousafzai has become a household name today in all corners of the world. 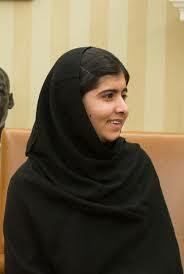 She has been awarded the Nobel Peace Prize award recently for her great service at such a tender age of only 17 years. This shows how special and different she is amongst those billions of people. You may wonder why I am talking about this now after so many days of her receiving the Nobel Peace Prize. I have been thinking of blogging about some inspiring people since many days. And now, I thought why not start with this our little girl Malala, the lovely daughter of our whole world. I got this idea the other day when I was watching the Nobel Peace Prize celebrations (re-telecast) aired on VH1 during which she was there giving inspiration to the audience about her activities. So, I am here writing about her. Malala Yousafzai has grabbed news in limelight since the attack on her by the Taliban militants in 2012, even though she has been very much active since her childhood on social activities. Let us have a look at her life till now to understand what is special in her. She was born in the year 1997 to a Sunni Muslim Pashtun tribal family in Swat valley, a popular tourist spot of Pakistan. Her father is a school owner running a chain of schools there. He is a poet and educational activist himself. So, naturally, she got much of her education under him. She got interested in politics and social activities since her childhood. The Taliban militants were predominant in Swat valley since her young age, banning social rights to women and girls like the freedom to speak, right to education and going to public places, etc. They suppressed them too much rigidly. Yousafzai got much disturbed about all this. Even at such tender age, she was worried about her fellow students and their miserable conditions. When she was in 7th class, she began speaking publicly about these atrocities through her blogs. With her father's consent, she wrote blogs for BBC website during the year 2008, keeping her identity anonymous as per the advice of the blog administrators. In those blogs, she blogged about the atrocities of the Taliban militants- how they banned television, music, and schools for girls and women and how they created a fear complex among them. There were too much insecurity and terror for them in Swat valley and around. She publicly attended one or two press conferences also where she talked about these issues and stressed the need for restoration of rights to girls and women. In 2009, there were two battles between the army and the Taliban militants in the Swat valley known as the First Battle of Swat and the Second Battle of Swat. During this period many schools have been destructed and there was a rule of terror all over the areas. The entire place took to a deserted look as all schools and establishments have been closed and people fled from the regions to safer places. Those who stayed could not move freely and had to hide for their lives. Yousufzai described all these incidents in her blogs and later in articles of New York Times. A documentary was filmed by New York Times based on her reports. Through this documentary, she got more publicity and the militants were angry with her and her father. Her father got a death threat from the militants to restrain from the social activities. With this threat, Mala's courage and determination increased and she decided to become a politician to serve the people and save them from the oppression. Malala continued her struggle against the oppression of girls and women by giving public speeches and interviews without fear. Her father also supported her in all her activities. She began gaining popularity internationally. She was nominated for the International Children's Peace Prize in 2011, even though it was awarded to some other one. She became famous as an advocate of human rights and girls' rights for education. Pakistan Government awarded her with National Youth Peace Prize in December 2011. A school was named in her honor and a campus for IT was set up on her request in the Swat Degree College for Women. The Taliban militants got much frustrated at all her activities and her increasing popularity. So they decided to kill her. One day on October 2012, when she was in her school bus, they shot at her after asking for her by her name as per the news. She was shot in the head seriously which damaged her brain, neck, and the shoulder also very badly. Her condition was very serious and even after the operation, the chances of her survival were doubtful. So she got shifted to the United Kingdom for better treatment in Queen Elizabeth Hospital of Birmingham. She was in a coma for one week. Her treatment continued for 2, 3 months. Then slowly, she recovered and got discharged from the hospital in the first week of January 2013. Malala Yousafzai continued her campaign after she became normal from Birmingham itself. The attack made her more popular among the whole world and all governments of the world realized the need to make Girl-Education a statutory law. Pakistan government also introduced the Right to Education Bill for the first time in their history. They also announced a huge reward for any information leading to the arrest of the attackers who shot her. In July 2013, Malala appeared at the United Nations Summit and addressed an elite group of educationists and leaders of the world on the right to education. Her speech created much waves and awareness among top leaders. Then, in the subsequent months, she met Queen Elizabeth and Barack Obama also along with his family members and inspired all of them with her mission. She has been awarded many awards and prizes for her works. She started Malala Charity Fund to help the girls and women all over the world. In October 2014, Malala got the Nobel Peace Prize as recognition of her great services at such a tender age of 17. She is the youngest ever to receive this great honor. Now, from the above, we are able to notice some rare qualities in her which make her a special child worthy of applause. She has undergone a lot of mental tension and physical torture and in spite of that, she did not get afraid of the circumstances that surrounded her nor did she feel insecure. She wanted to do something to make her people live a secured and happy life instead of indulging herself in her own enjoyments of life. She developed the guts to face circumstances for the betterment of her people. She took the problems into public limelight by boldly discussing the atrocities made on girls and women community by the militant groups. She did not care even for her life and continued her mission even after the brutal attack on her life by the militants. She suffered all the pains of the wounds and operations conducted on her brain and body in her fight for life for such a long period of 3 months and did not lose courage and hope. All these incidents only made her more determined and strong by doubling her willpower to fight more vigorously for the cause of human rights and education for women setting aside all her own personal enjoyments that others would have preferred at this prime teenage period of her. Malala Yousafzai is a special girl prodigy of our present world who should be taken as an inspiration by all of us in making our world a better place to live.